I eat a lot of raw food. It's taught me much about combining flavors and food combinations that I didn't know about before. And now I experiment a lot with it. Especially desserts. Although here I added some soft tofu to add a bit of a nutty flavor as well. So this is not totally raw. Here's my latest, just in time for your personal Thanksgiving feast after all the corn-syrup potatoes, store bought pies, and stuffed birds are out of sight. 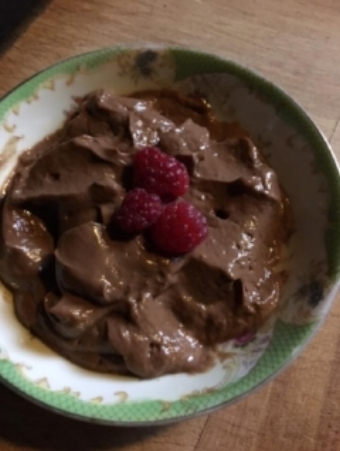 In the recipe, I use raw cacao powder because processing chocolate takes the minerals such as magnesium out of the cacao. Good quality cacao also has positive effects on cognitive function and cardiovascular functioning. All you need is a blender of some sort - your old Oster will work just as well as a high speed blender like a Vitamix - and the ingredients. Now - blend that all up until you get a creamy consistency.